Home » Blog » Education » Good God Gary! The Irish Times published an article on Tuesday 26th March which gave space to Mary O’Rourke and Dr. Gary Granville to present their respective view on whether history should be a compulsory subject. Dr Gary Granville is professor emeritus at the National College of Art and Design. He was formerly assistant chief executive in the NCCA. Clearly, the article focused purely on history despite the fact that the issue of whether or not history is made compulsory extends beyond history as a discipline. Mary O’Rourke’s piece was largely harmless and there is little to note about it. Although it is worth saying she was a member of a coalition government when Niamh Breathnach, a Labour minister for education, originally tried to remove history and geography from the core curriculum. Dr. Granville on the other hand had a few things to say which I felt demanded a response. He compared the mistakes a beginning artist makes with the mistakes experienced curriculum designers, and presumably teachers, make when designing new curricula. So, thinking falacy number one there. If this was true, then he would have an argument. However, he assumes that teachers of ‘discrete subjects’ do not make connections with other subjects (or teachers), nor indeed real life, outside of the classroom as if teachers are automatons who robotically read out syllabi in class. It is understandable that someone who worked in third level for so long, where the specialisms are more minute and where silos are particularly common, would think this way. Second level teachers tend to be more grounded in the daily reality of childrens’ lives and the need to make their subject relevant and engaging. He goes on to question the notion of history being ‘dropped’ from the core curriculum. He states that history was never compulsory for all students and quotes both the ETB and the Community and Comprehensive Sector. VECs/ETBs have become more academic and have come to the point where history and geography should be included in their core curriculum. The question Gary really should answer is why the voluntary sector had core history and geography. As for the Community and Comprehensive sector, these schools tended to follow the Rules and Programmes for Secondary Schools anyway and so they usually included history and geography in their core. If that is not enough, a Junior Cycle review by the NCCA themselves in 2004 noted that since 1999, all schools were required to teach history and geography. VECs were allowed (that is, if they wanted) to continue with ESS – Environmental and Social Studies – basically history and geography for less-academically inclined students (slight digression to note the impact of poor socio-economic planning that contributed to this, but that’s for another day). All of this, by the way, is secondary to the idea of that both history and geography should be in a core curriculum because of their value to individuals and society. The notion that a subject should not be in the core because it was not traditionally studied by all students is, essentially, a non-argument. Thinking fallacy number two. It is true that back then both subjects were half subjects – but they were never short courses (this concept did not exist in school curricula until the revised Junior Cycle); they were full rigorous courses, typically of two hours each week over three years (I still have my three Intermediate Certificate geography textbooks). Calling them ‘short courses’ is factually incorrect and feels somewhat manipulative to me. However, there is a simple thought experiment to test whether a complusory subject supports the quality of learning. Ask any teenager if they would like to study algebra! The vast majority will say no. At the end of a period of time, we can test the quality of their knowledge (and skill) in algebra. We can then compare that to those students who were required to study this math! This presumably is one reason why there remains compulsory subjects in the new Junior Cycle – English, Irish, Maths; presumbly the NCCA board, felt it was necessary to keep these compulsory. The board also felt that a new subject ‘area’ called ‘Wellbeing’ should also be compulsory. So Gary can’t have it both ways: he can’t criticise calls for history and geography to be in the core as a simple binary choice (in or out), and then ignore the binary choice that results in ‘Wellbeing’ and the others being compulsory. In fact, it is because compulsory subjects improve the quality of learning that the NCCA has made Wellbeing compulsory, that is the reason for it being not only compulsory but SO compulsory that Wellbeing is at the very centre of the new Junior Cycle curriculum and every other ‘learning experience’ (NCCA speak for subjects) is subordinate to it. Well, Gary, it tells us nothing. Because the issue with Irish is not that it is compulsory, but rather more closely related (in part) to failed curriculum policy (courtesy of the NCCA, irony of ironies), particularly at primary level (there are other reasons, but being compulsory is not one of them). The reality is, if a subject is not in the core, it will disappear from schools, eventually. Uneasy as Gary may be, this is in fact the case. History and geography are, factually, more important to the cohort, as a group, than materials technology. They are as important as science, but then science in not in the core either. Think about this for a moment. A country which is heavily reliant on multinational investment, specifically in the field of medical devices, chemicals, pharmaceutical and IT, does not ‘require’ students to study science! When I mentioned this in conversation with some teachers, their response was ‘ but sure every school is going to teach science’. Principals I spoke to were less sure. The reality outside the bubble of the NCCA is that schools have to find staff and build a timetable. Given the unequal pay scales, the cost of 6 years of training, the general relative deterioriation in the return on being a teacher over the last 20 years, and the difficulty in getting a full time permanent job in less than 10 years after graduation, schools are finding it increasingly difficult to find teachers. In this scenario, schools are either making subjects optional or dropping them altogether. If there are no jobs in a field, no one will train for that field. A core curriculum, at a minimum, ensures that there are some jobs available each year and contributes to making the profession (slightly) more attractive. But this is the weakest reason for a core curriculum. The point of a core is to guarantee equal opportunity of access to an equal education; the curriculum part is about addressing the basic educational needs of society, its citizens and the interactions between them. Well, Gary, the NCCA stopped at English, Irish, Maths and Wellbeing. But the question does have an answer; we stop when we have ensured every child at lower second level has been provided with a comparably equal education which which provides them with an introductory grounding in what it means to be an educated citizen living in a country called, in this case, Ireland (you can tell I don’t buy Margaret Thatcher’s notion that “there is no such thing as society”). For me, that is English, Irish, Maths, Science, History, Geography and a Modern Foreign Language. That leaves lots of room for, eh, short courses. For anyone really concerned about ‘discrete subjects, separate disciplines, self-contained experiences…..uncritically adopted’ inservice design and teacher training can contribute to interdisciplinary learning. I’m not sure where the ‘shared understanding’ bit comes in because the Junior Cycle Framework published in 2011 was developed in secret. Notwithstanding this, the NCCA published the draft 24 SOLs and then either realised there was an issue/had the issue pointed out to them/or were lobbied by sectoral interests and so released a revised 24 Statements of Learning. And the difference between the two editions? – the final version removed what was essentially ‘physical geography’ and added ‘science and technology’. Eventhough some sort of learning of history and geography could, but not necessarily be read from the SOLs, the reality is that schools cannot offer a subject if they cannot find the staff, and to find the staff they need to be able to offer the subject, and to offer the subject it should be in the core (of course, there are other considerations – unequal pay for a start). There are two aspects here – the syllabus, and the exam. A national syllabus, as far as is reasonably possible, ensures that all students get at least the same access to a guaranteed minimum education. A single terminal exam, at the end of a national syllabus, ensures that all students have an equal opportunity to demonstrate their learning, and it is fair. To suggest that schools could interpret the SOLs for themselves means that students from different schools will have widely difference experiences, which teachers on the ground know will fail to provide for many a solid foundation for progress in the senior cycle. This is not, and will not be the teachers fault. Lord knows they are struggling with the make-it-up-as-we-go-along approach to designing and implementing the curriculum. But the new JC allows for wildly unequal educational experiences. As ever, inequality hurts the weakest most. The NCCA has a very difficult job to do. I will post shortly on the Minister’s role in all this. But the issue is the knock on effect of making history a core subject while ignoring science, geography and a modern language. This knock-effect is not the ‘what-about’ calls from other subjects but rather the notion of a core curriculum laying out a basic, rigorous, equal education for all our children and their place in the future, versus a Mongolian Barbecue style buffet edutainment. The implications are very serious. Not only will placing history in the core (on its own) impact negatively on all other subjects, it will call into question the entire Junior Cycle Framework. It will also call an immediate pause to the Senior Cycle Review – which you can be guaranteed is further along the development road than is generally publicly known. Leave your comments below on your experience of this. 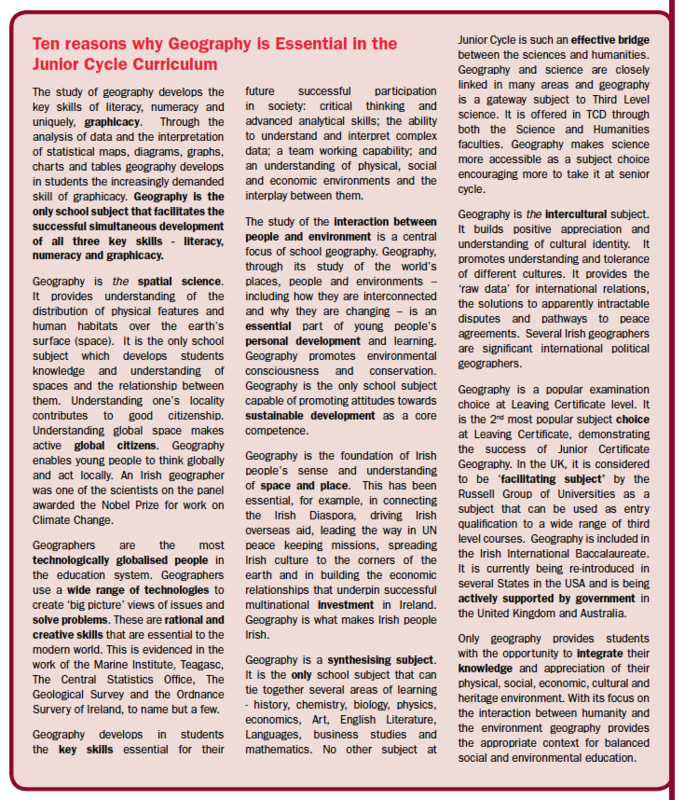 I am conscious that there are positives to the Junior Cycle, but also that there are many negatives, sadly. I asked the Irish Times for space to reply to Dr. Granville’s claims, and why geography should be in the core. I haven’t received any acknowledgment.